Since 1934, Scottish Rite in the Northern Jurisdiction has directed and financed the first coordinated research program into the cause of schizophrenia—the most widespread and serious form of mental illness. This research activity—of benefit to all mankind—is carried on with the cooperation of an advisory committee composed of leading medical scientists, psychiatrists and psychologists. Scottish Rite to date has appropriated more than $12,750,000 for this purpose. As a Masonic contribution to the Bicentennial observance, Scottish Rite constructed and opened a Museum and Library devoted to our national heritage. The attractive facility at historic Lexington, Massachusetts, has been erected by Scottish Rite members and friends for the purpose of disseminating knowledge of the country’s history, purposes and ideals among all the people—especially our youth. Scottish Rite sponsors the Leon M. Abbott Scholarships, named for the former Sovereign Grand Commander who by a generous legacy founded the Supreme Council Education and Charity Fund. Originally, Abbott grants when to university schools of journalism and schools of international service. Now, scholarships are allotted to the 15 states and in turn awarded to the offspring of Scottish Rite members and to young men and women who have participated in such youth organizations as DeMolay, Rainbow, and Job’s Daughters. Recipients may use grants at universities of their choice. More than $790,000 in scholarships has been awarded since 1952. In 1922, a college scholarship program was inaugurated with an initial appropriation from Supreme Council funds. In 1932, Leon M. Abbott bequeathed additional funds to establish an Education and Charity Fund. The first Abbott scholarship was awarded in 1951. For many years, the scholarships were presented to journalism students at selected universities throughout the Northern Masonic Jurisdiction. In 1984, it was voted to expand the scholarship program by awarding grants to children of Scottish Rite members and to young people active in the youth groups affiliated with the Masonic fraternity. In 1985-86, the first academic year, funds were allocated for 68 scholarships. – A child of a Scottish Rite Mason of the Northern Masonic Jurisdiction, who is a high school senior or currently enrolled at an accredited college or university, who has attained a minimum grade point average of 2.75 on a 4.0 scale. 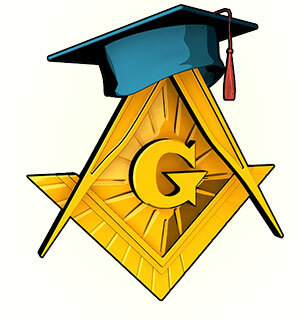 – A member of DeMolay, Rainbow, or Job’s Daughters in the Northern Masonic Jurisdiction, who is a high school senior or currently enrolled at an accredited college or university, who has attained a minimum grade point average of 2.75 on a 4.0 scale. – Grandchildren of members are also eligible through funds provided by The Dayton Masonic Foundation. They should apply using the same Abbott Scholarship application linked from this page. Scholarship applications must be postmarked by April 1st.